Q-Connect Cork Board. 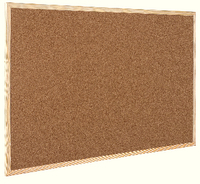 Lightweight notice board with wooden trim, supplied complete with fixing kit. Size - 400 x 600mm Approx Dimensions (CM): D60.3 W40.2 H1.5. Approx Weight (KG):0.51.